Firstly, my apologies for posting so many cooking write ups. I know a good portion of you are here to see some sweet outdoor pics or to hear about a cool trip. Realistically though, if you are out fishing, hunting or foraging as much as I am, your bound to end up with something to cook. As luck would have it, I find myself in this exact situation with a freezer full of freshly harvested Ontario grown Whitetail deer. Plus, if you know me at all, you know that I am not one to hoarde wild game until its claimed by the ice grip of freezer burn. No sir! I see it, I harvest it, I wait a moment out of respect for the animal, and then I eat it! Plus all these recipes makes for great posts and photo ops. Coming from a German family has given me a healthy appreciation for sausage making. I can recall as a kid, making pounds and pounds of the stuff. A little Bratwurst here, a bit of Kielbasa there. If you lived in my dad’s house, it was pretty likely you would be helping with sausage making at least once or twice a year. Although I may not have appreciated all the work back then, I am thankfull now I had the chance to learn this skill. What does this have to do with my post? Well venison makes some of the most exquisite sausage one could ever hope to taste. So it was with this goal in mind fired up the old hand grinder and set to work making some Venny sausage. Cliché or not, get ready for some serious Wurstherstellungs! Possibly one of the most popular recipes among hunters for ground venison would have to be the delicious pepperette. 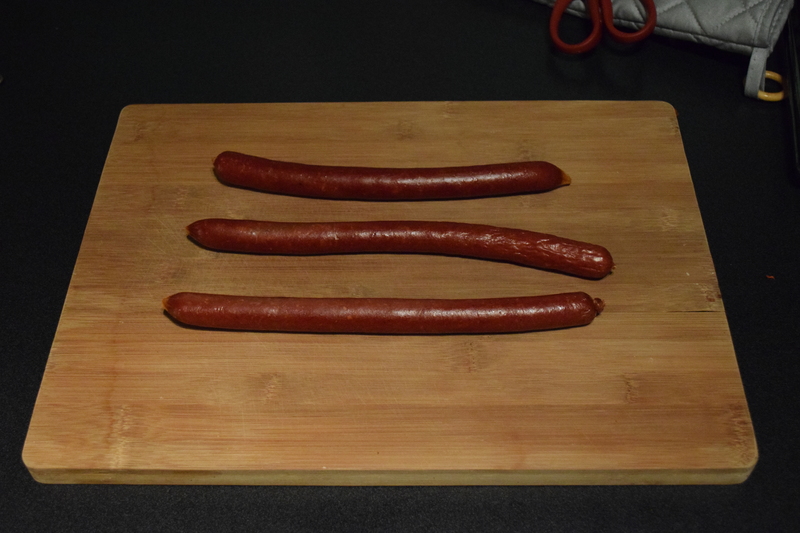 I chose to follow the recipe provided in Rytek Kutas’s book, Great Sausage Making Recipes with a few minor adjustments. Ive said it once, I’ll say it a thousand times, this is the absolute bible on sausage making (BUY THIS BOOK!). The ingredients included paprika, ground mustard, ground black peper, white pepper, ground celery, mace, granulated garlic, salt and Curing salt #1. To avoid copyright infringement I’ve conveniently forgot what quantities were used. If you want the recipe, spend a few bucks and give Rytek’s book a shot. Its solid gold. 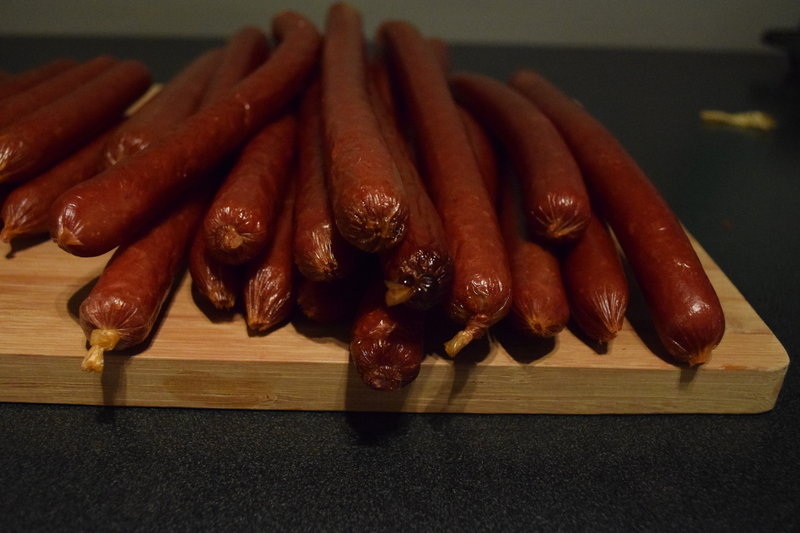 Rytek’s recipe includes fermento and dextrose which are used in semi dry cured sausages to give that tang that pepperettes are notorious for. I decided to drop out the fermento and rely on the smoke flavour to carry this sausage. The sausage was made with 80% venison and 20% pork shoulder. This makes for a good consistency, a great bind and awesome mouthfeel. 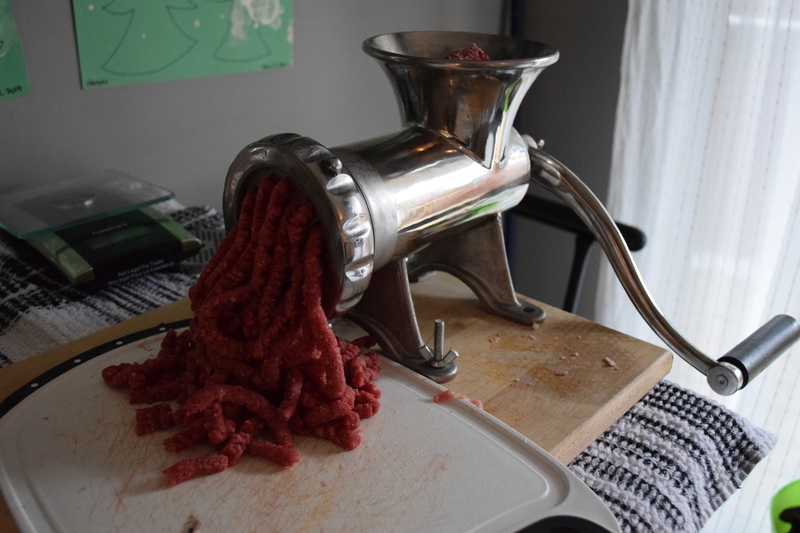 The meat was ground through a coarse die and again through a fine die once the seasonings were added. Once completely mixed and ground to the desired consistency, I stuffed them into 22mm collagen casings sourced from http://www.sausagemaker.com/ . A worthwhile link indeed! After stuffing, these little beauties went into the smoker for 4 to 5 hours. The sausages took on a deep red hue and have a pungent smokey odour. The result was some of the best, most badass pepperettes snacks I have ever tasted. Quite the appetizing little wieners if I do say so myself. 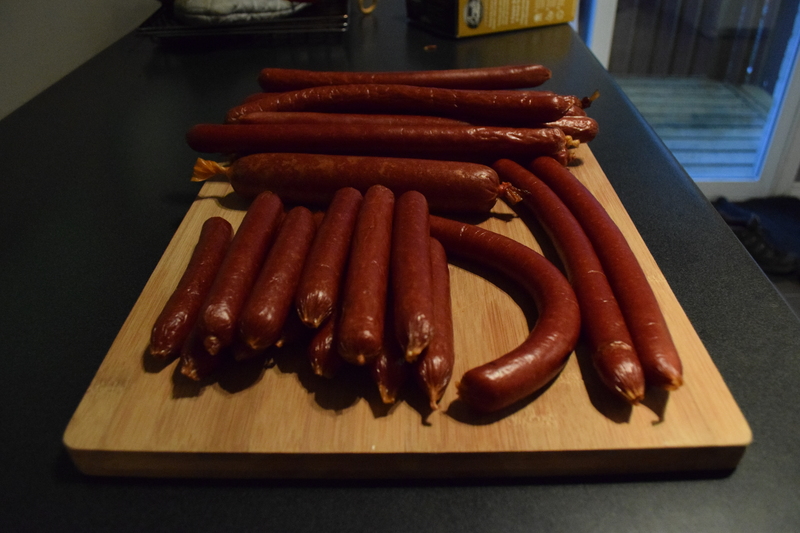 This entry was posted in Cooking, Fishing, Hunting and tagged Charcuterie, cooking deer, cooking venison, Cooking what you shoot, sausage making, veison pepperettes, venison sausage, wild ontario, Wilds of Ontario. Bookmark the permalink.